During November 2018, within the framework of the project “Modernization of Pedagogical Higher Education on the Use of Innovative Teaching Tools” (MoPED) of the EU program Erasmus + KA2 – Development of Higher Education Capacity, No. 586098-EPP-1-2017-1-UA-EPPKA2-CBHE-JP on November 17, 2018 were held a series of the workshops for teachers and students of the Borys Grinchenko Kyiv University. These trainings were presented by Viktoriia Vember, PhD, Associated Professor of Computer Science and Mathematics Department. The workshop “Tools to organize inquiry-based learning” was held at the Faculty of Information Technology and Management of Borys Grinchenko Kyiv University on November 7, 2018. This workshop was presented by Viktoriia Vember, PhD, Associated Professor of Computer Science and Mathematics Department. 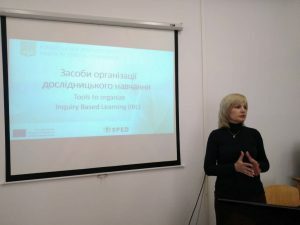 The training “Inquiry Based Learning and tools for its support” for the 5th year students of specialty Pedagogy of Secondary Education (external form of education) was held at the Pedagogical Institute of Borys Grinchenko Kyiv University on November 17, 2018. 10 students of the group PSOm-1-18-1.4z participated in the training, all of them are teachers of different subjects such as mathematics, computer science, byology etc.